If there’s ever been an Achilles heel to the Surface lineup it’s probably been battery life. The thin and light form factor powered by the same components in most laptops means there just isn’t the physical volume for a really large battery. The Surface Pro 4 offered just 39 Wh of capacity, although thanks to some miniaturization, last year’s Surface Pro was able to bump that to 45 Wh. For 2018, that capacity is unchanged at a rated 45 Wh, although the battery is slightly overprovisioned showing just about 48 Wh out of the box. 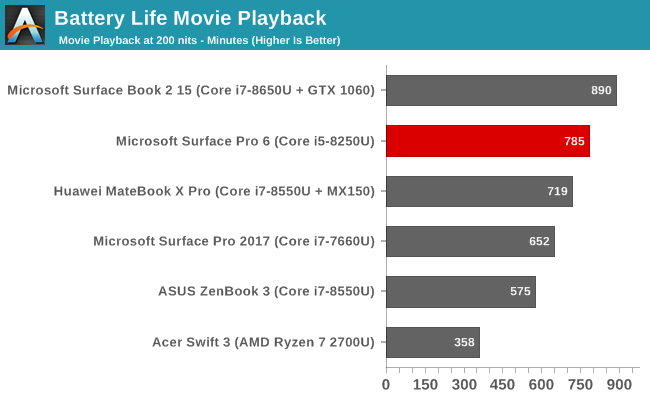 It’s still well off the 60 Wh that you’d find in a typical Ultrabook, but it’s much closer than just a couple of generations ago. The other side of the coin is efficiency. With each generation of device, it’s not uncommon to see some small gains here as well. 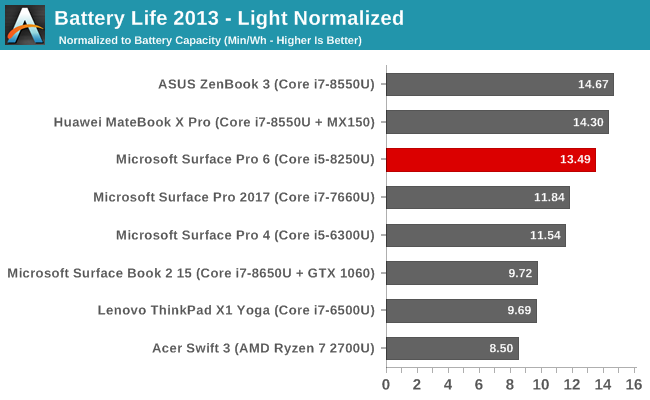 To see how the Surface Pro 6 fares, we’ve put it through our suite of battery life tests, which we run with the display set to 200 nits on all devices. Our test from 2013 we’re keeping around just because of the number of datapoints we have now, but this test has become too light for most devices. Still, the Surface Pro 6 has cracked the 10 hour mark in this test. It achieves 1.25 hours more battery life than the outgoing model, which is a pretty strong result. 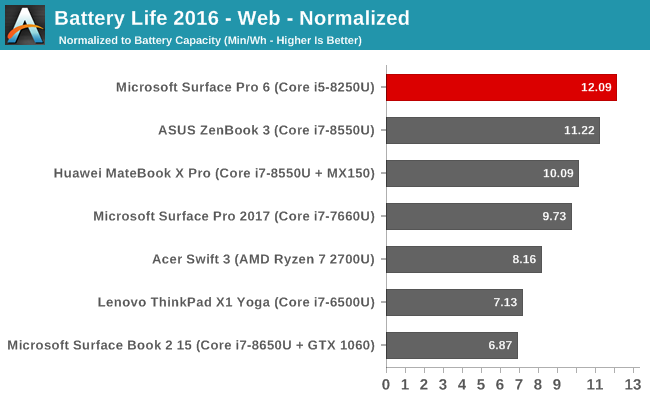 Our newer web test is much more demanding on the devices, and the Surface Pro 6 does admirably again. 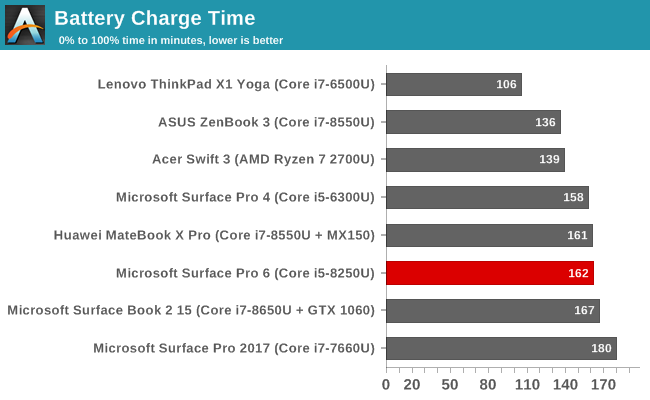 At just over 9 hours of battery life, the Surface Pro 6 achieves almost two extra hours of battery life compared to the 2017 model. That is a big gain considering the battery capacity is unchanged from 2017. By removing the battery capacity from the equation, we can get a measure of how efficient each device is. 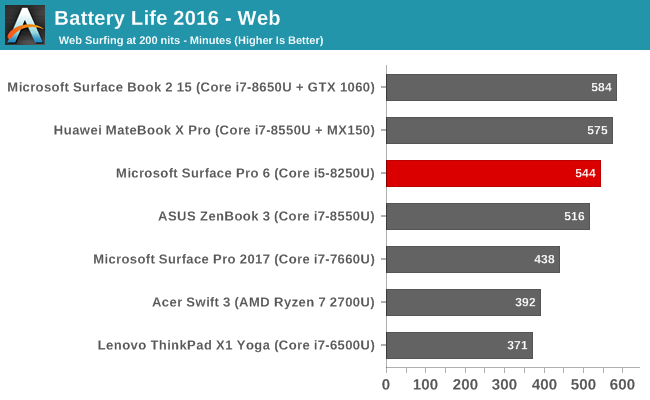 The Surface Pro 6 is right at the top in terms of efficiency on our heavier 2016 test, and a hefty step up over the 2017 model. 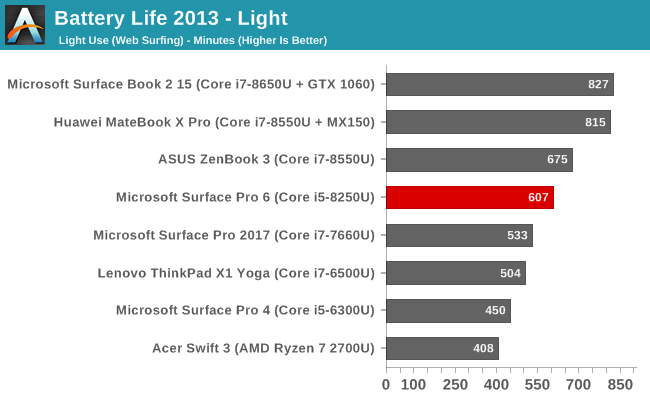 Despite the smaller than laptop battery capacity, the overall results are quite impressive, with the Surface Pro 6 improving quite a bit over the previous model, although we did test that one with the Core i7 which can be a factor. 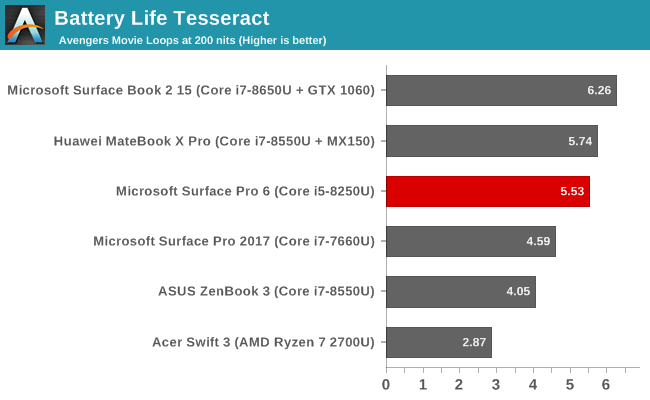 Still, the overall results are very strong, with the Surface Pro 6 well over the eight hours of battery life that we’d want in a mobile device. The Surface Pro 6 draws right around 5 Watts of power at 200 nits brightness with the system at idle, and that drops to just 1.22 Watts with the display off, so the system isn’t using very much power at all. Microsoft’s battery life claims on their specifications page for any of their devices always states battery life during local video playback. We test that as well, since it’s a common scenario for any portable device, but this is generally a best-case situation, since the video decode is offloaded to fixed function hardware, allowing the processor to go to sleep for much of the time. The Surface Pro 6 was able to get just over 13 hours of video playback at 200 nits brightness, which is very close to the rated 13.5 hours that Microsoft quotes, although they are likely testing at a lower brightness level. Our Tesseract score divides the movie playback time by the length of a long movie – The Avengers – to give a nice number for how many movies you can watch on a device before the battery is depleted. The Surface Pro 6 was able to get through over 5.5 copies of The Avengers on one charge. The Surface Pro 6 comes with the standard Surface charger, which we’ve become accustomed to over the years. It connects to the Pro with a magnetic connector on the with what Microsoft calls the SurfaceConnect port. For the Pro 6, it comes with a 44-Watt adapter which also offers a USB port for charging another device, which is very handy. The charge times are pretty standard for the class of device, with very few manufactures pushing for really fast charge times on laptops likely to increase the longevity of the battery.